The renowned Reeves of Washington, D.C. was a many splendored thing. So much so that for lack of space I had to leave out its other historical identities as Grocery Store, Tea Room, Confectionery, and Soda Fountain. Though called a restaurant, it was really a lunch room of the bakery/confectionery type which closed for the evening. Over its eleven decades in business the homely eating place expanded, changed focus, remodeled, went through three generations of Reeveses plus two or three other owners, burned, rebuilt, closed and disappeared for a few years, reopened at a new location, and through it all managed to build and hold onto an army of loyal followers who still miss it four years after it closed for good in 2007. How old was it when it closed? I figure it had been 112 years since its founding as a grocery store by Sewell A. Reeves in 1895. Although the restaurant itself as well as newspaper stories usually dated Reeves’s beginnings to 1886, I have found no evidence for that. In 1887, and up to at least 1892, the 1209 F Street site was occupied by G. E. Kennedy’s grocery store, while Sewell Reeves was identified in city directories as a clerk for other businesses. But whatever … Reeves was D.C.’s oldest surviving restaurant when it closed. According to a 1989 column by restaurant reviewer Phyllis Richman, its nearest competitor for longevity was Napoleon’s, established in 1925. 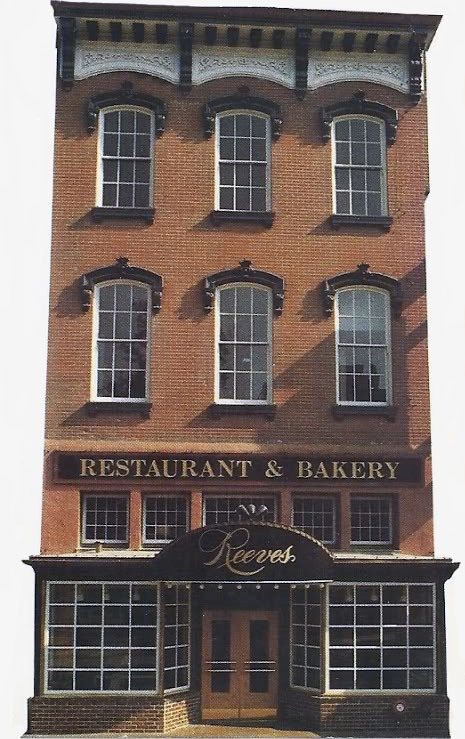 During its first three years of existence, Reeves expanded his grocery store by adding coffee roasting and candy making operations, a bakery, and a lunch counter which at first seated only 12 people. By 1902 he had enlarged the building with the bakery and candy departments occupying the second and third floors and the lunch counter lengthened to seat 150. At Sewell’s death in 1941 his son Algernon, who had managed the business since 1916, took ownership. After Algernon died the business was sold in 1966 by his son John to the Abraham brothers who remodeled the premises and successfully broadened the clientele from its traditional feminine base which had largely deserted F Street stores in favor of suburban shopping centers. The middle and late 1960s, characterized by racial unrest and downtown desolation, marked a low point for Reeves, and it would not have been at all surprising if had met its end around 1970 – but in fact it still had close to 40 years of life left in it. Reeves remained the kind of comforting eating place known for waitresses with long tenure and a menu untouched by the latest food fashions. Affordably priced dishes such as chicken salad sandwiches and pie, especially strawberry pie, were dependable favorites. Reeves went through the 1970s with its somewhat dowdy appearance intact. High ceilings were equipped with fans and brass chandeliers, while Tiffany lamps hung over the 100-foot dark cherry counter. [pictured] Then, in 1984, a disastrous fire destroyed the interior. When Reeves reopened in 1985 it had an entirely new look, with blond counters, exposed brick walls, and a dropped ceiling effect with recessed lighting. The old booths were gone, replaced with more comfortable ones padded in dull maroon. 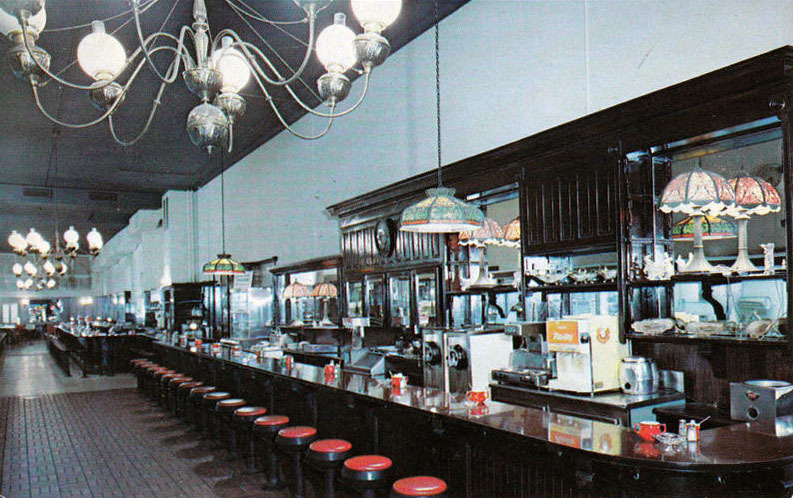 Of the original fixtures only the wooden counter stools remained. Customers had barely adjusted to the modernization when the next blow came in 1988 when the property was sold for $7 million to a developer planning an office building. But Reeves wasn’t finished yet. In 1992 the restaurant’s former general manager reopened it barely a block away on G Street, rehiring much of the old staff and for the next 15 years turning out thousands more strawberry pies. I have no doubt that even now the occasional visitor can be found on F or G streets looking for Reeves. The hot fudge sundae with pecans!!!! The fudge was beyond wonderful. Anyone know the recipe??? My aunt Mary Keys worked for reeves bakery for 30 years. The strawberry pies were so delicious. My Aunt would give my sister and me Easter Boxes of Chocolate Cake Eggs decorated beautifully — so tasty. Sitting inside at the fountain having lunch, chicken salad sandwiches on toast, was such a pleasure. It was so wonderful. It was a good life, very fancy way of life. I remember going to Reeves for Birthday lunches with my grandmother in the 1940’s. The waitresses had hankies in their blouse pockets with fancy crocheted edgings. Egg salad sandwiches were my favorites. Just yesterday, June 11, my daughters and I treated my husband to an early Father’s Day dinner at Ruth Chris Steak House and seeing that we were a little too early, we drove around the area doing a little sightseeing. We drove along G Street, past the last location of Reeves and I felt a little choked up remembering a favorite place for lunch I enjoyed over the years. So sad to see another DC icon disappear! My dad and I would go Reeves after church. I always had a slice strawberry pie. That was in the mid and leave 40’s. Always had the soldiers in town. I remember the day that I wore the strawberry pie all over my white outfit!! I was carrying the pie home to Annapolis!! Long commute by train–need I say more. My parents used to go to Reeves when they were kids. I Always stopped by there for their strawberry pie when I went downtown. Just loved the place. Never really cared for the G St bakery, but they still served those wonderful strawberry pies. Another old Washington store gone …but not forgotten! This article from 1991 tells a few more facts about Reeves, including why the recipe for strawberry pie just isn’t to be had! Not the original, anyway. baked goods. We miss it greatly. Staff was always nice. Food Great. A classic East Coast food place. My Mom use to take me to Reeves when I was a kid. That strawberry pie was heaven as was the fresh peach pie. I remember taking my niece there when she was a kid, had to leave because a big cockroach was crawling up the wall. After that nasty experience, I never went back! Sorry to hear this comment. For us as very devoted customers never had that kind of experience. If they open again we will be back. True. I spent some of my first few working years in D.C. Reeves was the place to go between job interviews to get one’s mood fortified. Even if a cup of tea and one slice of strawberry pie was all that could one had money for that day… you just knew after that wonderful pie that things would turn out well if you kept trying. Does anyone know or have the recipe to Reeves’ BAKED Strawberry Pie? Oh how I miss that pie. How the large berries stayed whole (w/o getting mushy during baking) is beyond. I’m with you. I loved their strawberry pie and would love to have the recipe. Please someone help us out. Jan- Is there a plaque or anything of sorts marking the existence of Reeves on its old streets? Hi Jim — Not that I’m aware of.